A personals site for single Seventh Day Adventists. Adventist Singles Connection is a religious-themed subscription service operated by Sparks Networks. 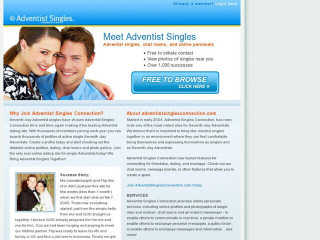 Adventists Singles Connection is a long-running religiously centred dating site for Adventists. What they offer: Their service includes picture profiles, chat facilities, email, and matchmaking software to help singles become acquainted with one-another. They cater for you if you're looking for friendship or romance. Free membership grants you basic access rights, without full communication. This is however a small matchmaker by today's standards so your choice of a partner will not be overwhelming. You start by filling out the easy online form. You will then be able to browse profiles of Adventist women and men. To make the search easier, you can simply make use of their unique Ideal Match compatibility software. With the advanced search option you can locate prospective matches in the immediate area or anywhere in the world. The "think you'd click" button lets you instantly notify others of your interest in them (available to non-subscribers). Instant message and chat features can also be accessed by upgrading the free Basic membership to Premium for a monthly, quarterly or semi annual fee. Adventists Singles Connection is clearly a religious matchmaking site with a specific purpose. They offer a number of resources for those just venturing into the world of online dating. Helpful articles give tips and advice while member success stories inspire and uplift. Each member is also offered their own onsite personal email, access to a singles message board, personal photo albums and anonymous message options. Rss Feeds. Subscribe to comments for this site. [?] Receive updates about Adventistsinglesconnection.com directly through your newsreader. I am an adventist young man looking for a religious lady to be friends with. I am now staying in Arusha and would appreciate your response. Yours, Ndabigaye. I am seventh day adventist looking for guy who is adventist to become my lifetime partner. I will love to meet a nice single girl around my age, I am 30 no kids so, hope to hear from you. I have been trying to join as a new member. I cannot get past personality/traits. There is nothing to click on to continue. Can you help me? I'm an Asian Adventist woman of 37, hoping to find Adventist man who wants to serve Jesus with all of his heart, with all his soul. A man is loves to pray and wants to be Jesus disciples with me. I would like to meet single Adventist men out there, i am an Adventist girl. Perhaps we can get to know each other and become more than friends. I am an Adventist Christian woman of 42 looking for an Adventist Christian man of 40-50. Perhaps we can get to know one another and for a special relationship that can lead to marriage. Adventists Singles 3.15 13 A review of Adventists Singles. A personals site for single Seventh Day Adventists. Adventist Singles Connection is a religious-themed subscription service operated by Sparks Networks.